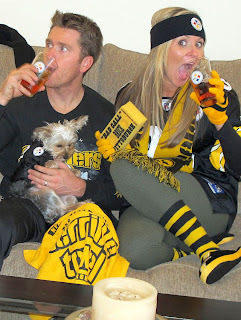 Set This Circus Down: Here we go Steelers, here we go! 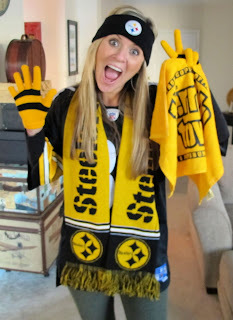 What can I say, I'm a Steelers fan thru and thru! I was born in Pittsburgh...... It's in my blood.... I was raised to bleed black and gold.......... I can't help it. Bry plays my game and roots for the Steelers, but only when the Chargers are out of the playoffs. Up here, its all about the hockey! We bleed, like you do for the steelers, for our hockey teams! Wow you are a super fan!!! I love it!! So cute...you are both adorable...as always! ok, you are way too cute!! i love that you go all out! !